Butterick 4071. 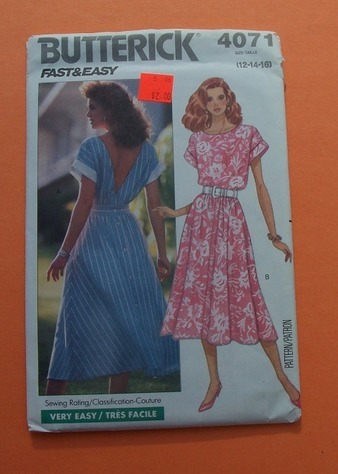 Misses' dress: Dress, below mid-calf or lower calf, has loose-fitting, blouson (front) bodice, waist inset, flared skirt, side pockets, back button closing and short sleeves with self or contrast cuffs. Narrow hem. Condition: uncut/copyright 1989. Size 12-14-16.